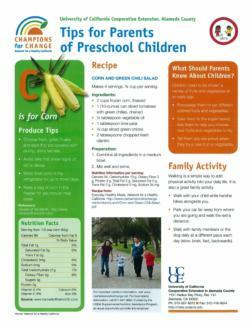 This page is intended for Parents of Preschool Children. This Month - At Your Child's Site! Choose fresh, green husks and ears that are covered with plump, shiny kernels. Avoid silks that show signs of rot or decay. Store fresh corn in the refrigerator for up to three days. Keep a bag of corn in the freezer for last minute meal ideas. What did your family think of the Corn and Green Chili Salad recipe? They did not like it. We did not make the recipe.